The Tennessee Athletic Commission has issued formal complaints to six individuals involved in the worst brawl in MMA history at last month’s “Strikeforce: Nashville” event. The TAC would not reveal the identities of the six perpetrators, however Sherdog.com has confirmed with Cesar Gracie that three of his students have received letters from the commission. 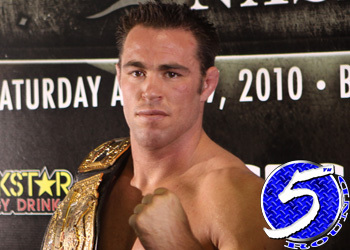 Potential/future UFC middleweight Jake Shields, lightweight Gilbert Melendez and 170-pound grappler Nick Diaz were the fighters Gracie said were contacted by the TAC. All three are Strikeforce champions. Although the younger Diaz brother, Nate, was dead center when the chaos went down, he did not receive a letter because he wasn’t a licensed cornerman for Shields’ title defense against Dan Henderson. Nick was Shields’ official cornerman. All six individuals that received the letter of complaint have two weeks to respond. They are subject to suspension, having their license revoked and/or a $250,000 fine. Shields shocked the MMA community when he easily took home a unanimous decision victory over Henderson in the night’s main event, but it was the ruckus that ensued on CBS’ live broadcast that caught the Internet by storm.